– Immediately call Lincoln at your Service at 1-888-578-4141 if you turn on a faucet and no water comes out. This may indicate pipes have frozen. We also ask that you notify the District Office if you see water leaking from the foundation of any building, which could mean a leak in an unoccupied home. – Please ensure the water faucets in your home are open to allow a slow drip of water to flow through the water lines. Detach water hoses and store for the spring. Ensure the hose bibs have been shut off..
– Open cabinet doors underneath sinks to allow warm air to circulate around the water pipes. 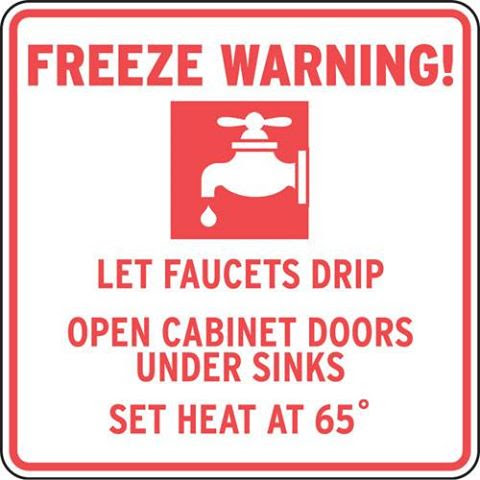 – If you plan to be out of town or away from your home for more than 48 hours, please notify the office so your home can be monitored periodically for frozen or burst pipes. – When not at home, PLEASE DO NOT TURN YOUR HEAT OFF. Additionally, leave bathroom doors open so that the warmer air can circulate. – Leave the heat turned to "Auto" with the thermostat set at NO LESS than 65 degrees, especially if you will be gone for more than 24 hours. PLEASE DO NOT TURN YOUR HEAT OFF FOR ANY REASON. – Bring pets inside! Please do not leave any animals outside unaccompanied for anytime longer than a quick potty break. Continue to follow local media for updates with the weather conditions and advisories. Please do not post any maintenance requests or emergency needs on Facebook as this page is not monitored for that information. We encourage you to share this information with your friends and neighbors as these steps will mitigate potential damage to your home.